Yest another interpretation of the King Arthur legend, First Knight is Arthur-light. 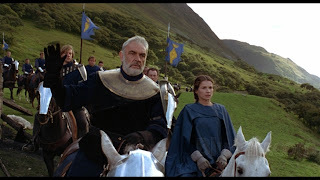 Featuring a mildly nauseating relationship between Sean Connery's King Arthur and Julia Ormond's Guinevere, Arthur is a full 35 years older than his great love, and to no surprise, there is no passion but lots of ick between Connery and Ormond. This Guinevere is much more interested in Lancelot, played by a long-haired Richard Gere as a dashing, carefree, personal-freedom loving expert swordsman. Director Richard Zucker works hard to generate some sparks between Ormond and Gere, and ultimately some passion emerges, but it's all at the level of superficial infatuation driven by Hollywood heroics. Christopher Cross as the evil Prince Malagant pops up at appropriate moments to snarl his way through the movie as the designated bad guy, dressed all in black to make the point, and while he thinks he's after control of Camelot, what he is really doing is placing Guinevere in a succession of damsel-in-distress situations from which Lancelot can heroically rescue her to move their love story along. Prince Malagant has split from King Arthur and is seeking to establish his own dominion by all means necessary. While the wise old Arthur is all about shared democracy and doing good for the people, the young and aggressive Malagant is only about hard-nosed leadership delivered by the sword, aimed initially at the heart of Leonesse, the territory ruled by Guinevere. Lancelot cares only for his personal freedom and not much else, but finds himself helping Arthur and lusting after Guinevere. And yes, it all sounds remarkably like Obi Wan, Darth Vader, Princess Leia and Han Solo transplanted to medieval England. Gere makes no attempt at a British accent, but he and Connery are never less than watchable, and their presence gives William Nicholson's average script enough weight to be tolerable. Without the megawatt stars, First Knight would have been conclusively third rate.